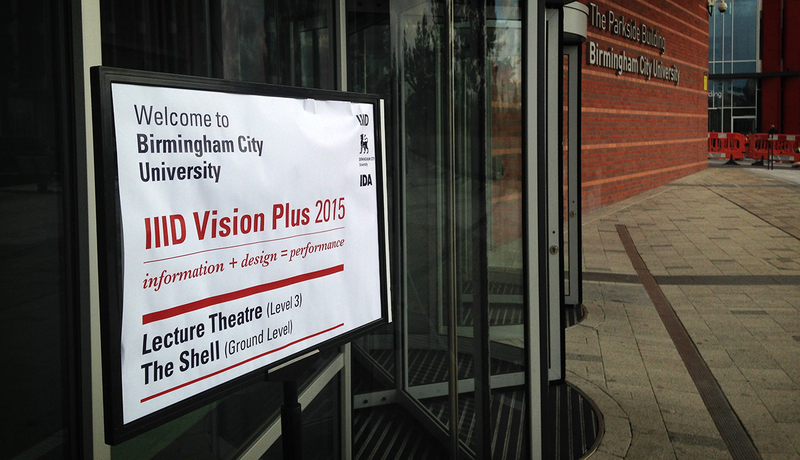 Some interesting talks at the IIID Vision Plus Conference this year, held at Birmingham City University. The two-day conference provided an engaging discussion of the ways in which information design relates to and improves performance in different areas. Some might be more direct, such as healthcare and wayfinding, and other are not so obvious, for example the performing arts. Two graduates of the MA Information Design programme at the University of Reading presented at this conference. Oliver Tomlinson, head of TDL London talked about his experience in the design of diagrams and how they can benefit businesses. TDL London specialises in applying information visualisation in the creation of bidding documents, for example major construction projects. They work with documents supplied by the client and rethink the delivery of the information in a visual way to make it easier to understand and more engaging. The bids are comprised of technical and commercial information, and so the transformation has proved key in helping companies win business. In his talk, Oliver discussed the benefits of embedding an information designer in the client’s workspace, and how that has facilitated the communication of specific needs of the client. This entry was posted in Afterword. Bookmark the permalink.